Fear. Uncertainty about the future. Some of the most difficult elements of the cancer experience are well-suited for mindfulness, and 20 years of research into Mindfulness-Based Cancer Recovery (MBCR) is beginning to bear out the benefits. Plus — try this breathing meditation to alleviate insomnia. Twenty-five years ago, Linda Carlson was a graduate student in a clinical psychology class at McGill University when she met a classmate who would become her meditation teacher. He had just returned from seven years at a Thai monastery and offered to lead a small group of students in a weekly sitting meditation. Carlson immediately joined him, along with Kirk Brown, author of the Mindful Attention Awareness Scale, the first measure developed to self-report mindfulness. Brown knew Jon Kabat-Zinn, founder of Mindfulness-Based Stress Reduction, and eventually invited him to speak at the university. As Carlson sat riveted in the audience, she had no idea that she would later adapt his MBSR program to help women in cancer recovery. As a PhD student, she studied hormones and behavior in Alzheimer’s patients and healthy older people. By her internship year, she had found her calling in psychosocial oncology and mindfulness. Today, she is a full professor in the departments of oncology and psychology at the University of Calgary and a clinical psychologist and director of research at the Tom Baker Cancer Centre. Over 2,000 people have been through the yoga and meditation program at the centre, in groups of 15 to 20 at a time. I caught up with Dr. Carlson by phone and we talked about her pioneering research and clinical work on mindfulness practice in cancer recovery. Lu Hanessian: Two decades ago, during your internship year as a grad student, some of your colleagues were just starting a mindfulness group for cancer patients and survivors. At that time, you had already been practicing mindfulness and yoga for several years. Did this feel like a perfect fit for you? Linda Carlson: I remember when I came in as a student, it felt like a huge “a-ha!” for me. A lot of people who work in oncology have some experience with losing a loved one, a parent, but that wasn’t the case for me. It was a really interesting way to study the mind-body connection. I introduced my colleagues to MBSR, and we started adapting the program for our patients. It had yogic elements, pranayama, mindfulness meditation. My colleague Michael Speca and I went down and trained with Jon Kabat-Zinn. As we published more, we realized it needed its own identity because it wasn’t standard MBSR, but an adaptation. LH: An adaptation which you called Mindfulness Based Cancer Recovery or MBCR. You and Michael Speca wrote a patient manual in 2011 called Mindfulness-Based Cancer Recovery: A Step-by-Step MBSR Approach to Help You Cope with Treatment and Reclaim Your Life. What were you looking for in your first studies with cancer patients? LC: At first, we looked at psychological outcomes. We focused on stress symptoms, mood disturbance, anxiety, depression, anger, physiological as well as psychological stress through self-report. The first study we did, published in 2000, was seminal because it was the first study anyone had ever done with mindfulness as a scientific framework with cancer patients. LH: What outcome did you observe in cancer patients who had followed your MBCR program? LH: You went on to study immune function, hormones, and then, a few years ago, telomere length in breast cancer patients. Specifically, whether the MBCR program or a support group intervention might have any effect on telomere length, the protein complexes at the ends of chromosomes which are associated with aging. LC: As people get older, their telomeres get shorter as their cells divide successively. But we also see shorter telomere length in certain diseases, like cancer, and in people under certain chronic stress like caregivers. In our study, we found that the group who had the MBCR intervention or support group had no change in telomere length. In the group that did not have the intervention, their telomeres had become shorter after that three-month period. It was the first time anyone had shown an impact of a short-term intervention on telomere length. LH: An impact on a cellular level. So these mindfulness interventions seemed to help maintain or slow down the shortening of telomere length and slow down cell aging? LC: Yes, even though the effect wasn’t huge and we don’t actually know what the magnitude means in terms of disease progression and life expectancy, it definitely was a fascinating and compelling outcome. LH: Is there is a biology of mindfulness? LC: Actually yes, we do know that mindfulness practice down-regulates sympathetic nervous system activity and up-regulates the vagal nerve and parasympathetic nervous system which stimulates the relaxation response. And we know that this is tied into the immune system, so it also results in less inflammation and less of the psychological symptoms associated with inflammation. We also know that inflammation is tied into what’s happening with gene expression. LH: All of which is important to improving health and promoting recovery. In what ways is a mindfulness approach relevant to the cancer experience? Are there parallels? For many people, it’s a catalyst or transition period. They look at their life and wonder what’s important. What are my values? What does an authentic life look like? What brings me meaning and purpose? LC: It turns out that some of the most difficult elements of the cancer experience are very well-suited to a mindfulness practice. When a person gets diagnosed, there’s fear and uncertainty about the future. There’s the loss of routine and predictability. There’s the physical aspect, the treatment or surgery, pain, insomnia, which almost everybody gets, and the post-treatment fatigue. A lot of people find the hardest time is from active treatment to survivorship or post-treatment period where all of a sudden, it’s time to get back to one’s life, but what’s the new normal? For many people, it’s a catalyst or transition period. They look at their life and wonder what’s important. What are my values? What does an authentic life look like? What brings me meaning and purpose? LH: One can see how all those questions dovetail with a choice to practice living more mindfully, meaningfully—and fully. LC: It’s beautiful, actually, and people are so open at this point in their life because they’re scared and live with that anxiety. Being in this present moment, letting go, practicing non-attachment and acceptance are so helpful in dealing with uncertainty and fear. Mindfulness is something that they use for the rest of their lives for really great benefit. We’ve done interview studies with people, and we hear amazing stories about how their lives have been transformed. LH: Through this work, have you found that mindfulness practice is a gateway to self-compassion for you patients, feeling tenderly connected to one’s body, even as it changes? In many ways, MBCR becomes a complete do-over for people. LC: Absolutely. People may have feelings of betrayal that their body has let them down. Many people feel that they had taken good care of themselves and still got sick, so it’s a re-acquainting, a re-friending of the body. That’s why the body scan exercise is so helpful. The yoga and the mindful movement part of the program is important too, because it’s embodied. In many ways, MBCR becomes a complete do-over for people. LH: Are patients in the your MBCR program a different kind of student when it comes to learning and practicing mindfulness? It’s that recognition that life is temporary that allows us to live more fully in the moment. LC: People with cancer are the best students! They’re the most dedicated practitioners, because, in a way, they have the most to lose. It’s that recognition that life is temporary that allows us to live more fully in the moment. People don’t ask to be diagnosed with cancer, but they’re given an opportunity to, in a real sense, experience the vividness and the exquisiteness of the moment. LH: Teaching these MBCR groups is the only clinical work you do now. Why? LC: Because it reminds me every time why I do the research and what’s important in life. It’s easy to to get swept away in the day to day fatigue, deadlines, and pressure. Doing this work is what keeps me grounded. According to the National Cancer Institute, up to half of cancer patients have trouble sleeping. Insomnia is the most common sleep disturbance, affecting up to eighty percent of patients. Emotional distress, side effects from medications, and pain all contribute to difficulty falling asleep. But insomnia is not mere inconvenience. Getting adequate deep sleep lowers stress hormones like cortisol, boosts immune function, reduces inflammation, and promotes the body’s healing mechanisms. Dr. Linda Carlson teaches her patients a breathing exercise that has been successful in helping them relax and fall asleep. Based on what she calls “2 to 1 breathing,” this exercise is best done while in bed, in a dark room, in preparation for sleep. Begin by lying on your back. Breathe in for a count of 4, exhale for 8. Do this 8 times. Turn to your left side. Breathe in for 4, out for 8. Do this 16 times. Turn to your right side. Breathe in for 4, out for 8. Do this 32 times. This 2:1 breathing exercise combines gentle, diaphragmatic breathing with an extended exhalation, which shifts the autonomic nervous system from sympathetic “fight-flight” response to the body’s “rest-and-digest” parasympathetic response. “By lengthening the exhale, you’re stimulating the parasympathetic system’s relaxation response which reduces stress and calms the mind,” Carlson explains. What’s the purpose for switching side from left to right and specifically ending on the right side? 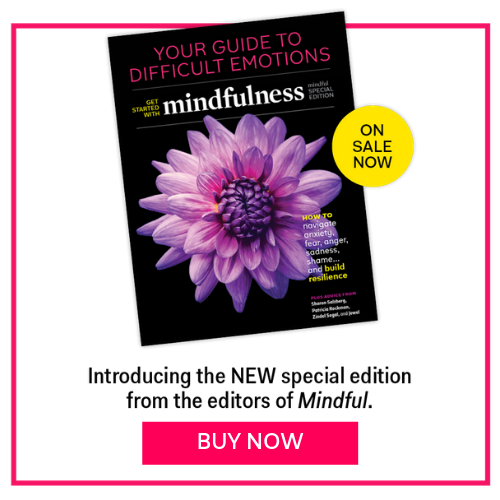 For an online version of MBCR, visit emindful.com. Lu Hanessian is an award-winning science journalist, speaker, and author of several books including Let the Baby Drive: Navigating the Road of New Motherhood (St. Martin's Press). For the past 15 years, she has taught international workshops on mindful living, the brain science of thriving, and cultivating connection and well-being through chaos and conflict. A veteran television host, Lu is a former NBC Network anchor and Discovery Health Channel host, and hosted The Science Show, syndicated in 110 countries and translated into 17 languages. She is the founder of several initiatives, including parent education resources Parent2ParentU, “Raising Mindful Families” and “Raising the Future Now,” an expert interview series. Her articles and essays have been published in The New York Times, USA Today, Redbook, parenting magazines, and she has been a guest on CNN, NPR, WABC radio, MSNBC. She is also a frequent education and parenting expert on FOX5 in New York. Lu moderated a PBS “This Emotional Life” special on attachment through the lifespan. Her two upcoming books The Heart of Connection and Reframe will be published later this year.